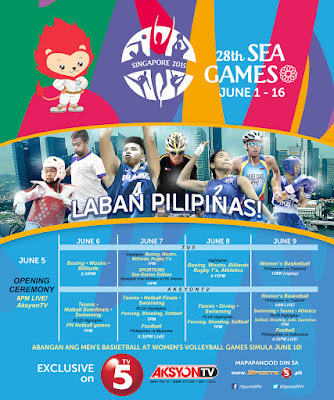 “Laban Pilipinas!” TV5, the country’s official Olympic broadcaster, once again leads the entire country’s charge of this famed battle cry, as it rolls out its exclusive coverage of some of the most popular and widely-followed sports in the highly-anticipated 28th South East Asian (SEA) Games in Singapore. Being the bona fide ‘basketball nation’ that the Philippines has been known by the entire world to be, Pinoy fans and religious followers of the sport will be delighted to know that they will be able to keep close tabs on both the Gilas Cadets (Men’s Basketball team) and Perlas Pilipinas (Women’s Basketball team) in this regional, biennial event. The Men’s team, which is led by hard court standouts Marcus Douthit and Kiefer Ravena, will first test their wares against Indonesia on June 10 (Wednesday, 1:00PM, LIVE on TV5); followed by Malaysia on June 11 (Thursday, 4:00PM, LIVE on TV5); and Timor Leste on June 12 (Friday, 6:00PM, LIVE on AksyonTV). Their counterparts, Perlas Pilipinas, led by veteran Merenciana Arayi and Fil-Am Sofia Roman, will begin their journey against Thailand on June 9 (Tuesday, 9:00AM, LIVE on AksyonTV); Vietnam on June 10 (Wednesday, 9:00AM, LIVE on AksyonTV); Malaysia on June 11 (Thursday, 12:00NN on TV5); and Indonesia on June 12 (Friday, 12:00NN, LIVE on TV5). All eyes will definitely also be on the country’s volleyball teams, who will be marking their return to the regional stage for the first time in 10 years. The Women’s team, bannered by volleyball superstar and official Philippine team flag bearer Alyssa Valdez, will first take on Indonesia on June 10 (Wednesday, 12:00NN, LIVE on AksyonTV); Malaysia on June 11 (Thursday,10:00AM, LIVE on AksyonTV); and Vietnam on June 13 (Saturday, 10:00AM, LIVE on TV5). Meanwhile, the Men’s volleyball team will slug it out against the region’s best, beginning with Malaysia on June 10 (Wednesday, 7:00PM on AksyonTV); Myanmar on June 11 (Thursday, 7:00PM on AksyonTV); and powerhouse Thailand on June 14 (Sunday, 1:00PM on TV5). Also, viewers who have followed the challenging matches of the Under 23 Men’s Football team during the team’s earlier games, can still continue to cheer for them as they leave it all out on the field against Myanmar on June 7 (Saturday, 8:00PM, LIVE on AksyonTV); and Indonesia on June 9 (Tuesday, 8:30PM, LIVE on AksyonTV). For the entire country to enjoy a complete SEA Games viewing experience, TV5 will also be closely monitoring the journeys of the other athletes who will be representing the Philippines in other sporting events. Viewers and netizens can expect daily updates on our brave Kababayans who will be competing in Boxing, Wushu, Billiards, Tennis, Netball, Swimming, Rugby7’s, Diving and Athletics. On top of these, the Kapatid Network will also give viewers a chance to catch up on the highlights from other sports, such as Fencing, Shooting, Softball, Judo, Equestrian, Bowling, Archery, Rowing, Taekwondo, as well as Cycling. 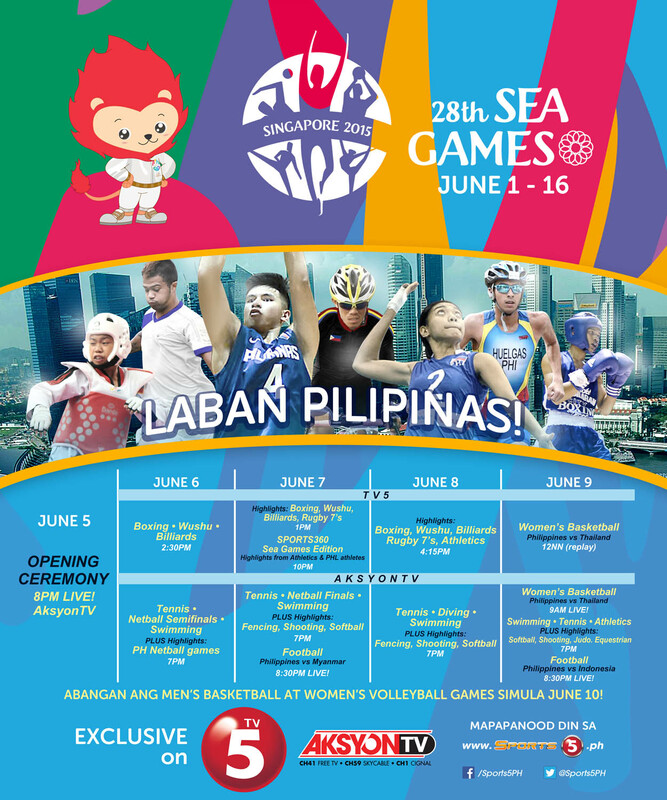 Viewers will get to witness for themselves the much-awaited grand opening ceremony of the 28th SEA Games that will be broadcast LIVE from Singapore’s newly-built National Stadium on June 5 (Friday, 8:00PM via AksyonTV).